The old mountain village of Valloire is perfect for a family-friendly winter sports holiday. The inviting stylish chalet is in the far-stretching skiing area of Valloire-Valmeinier. 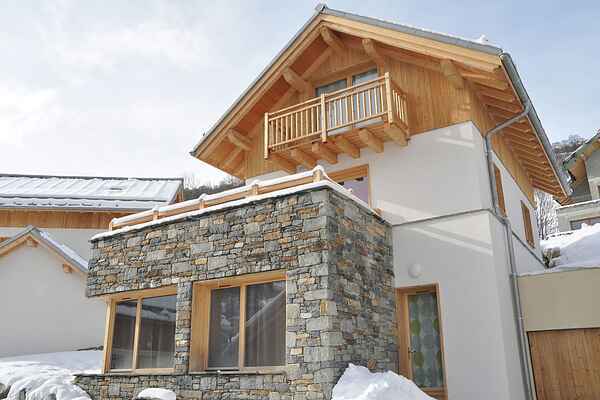 It is situated in the neighbourhood of Les Clots, at about 700 metres from the ski lifts and the village centre. The neighbourhood has a stop for the free bus-service. FR-73450-46 The traditional and comfortable chalet has been decorated in a modern style and features a large balcony with a view. There is a room with a sauna and jacuzzi. It has three floors; the uppermost of which has many slanted ceilings. The living room has a seating and dining area with wood furnace and flatscreen TV. There is a fully equipped modern kitchen. There is also a large playroom with foosball, big flatscreen TV and DVD player. In total there are 6 bedrooms: two with double bed (160cm) and TV, two with double beds (140cm), one with two single beds, one with four single beds and one with two single beds. Two bathrooms with bathtub. Bathroom with walk-in shower and three washbasins. Three separate toilets with washbasins. There is a room with a washer and dryer, a covered parking space for two cars and a ski storage room with heated shoerack.